Having compleated the Munros last year and the Furth Munros last week, I was curious to know what company I was in. I turned to the SMC website and fired up my Excel spreadsheets. 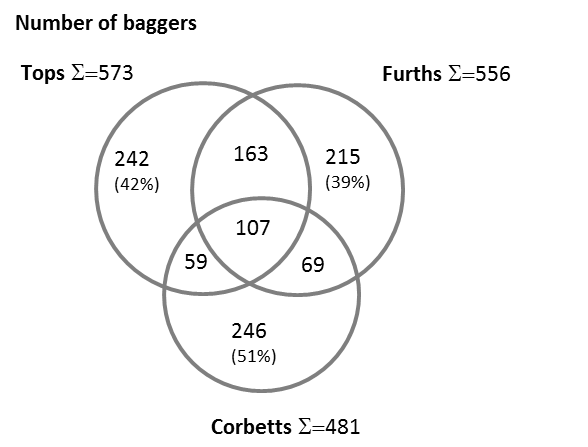 But I am a data fiend, so I quickly got drawn deeply into the world of Munroists, Toppists, Furthists and more. Below I offer answers to such exciting questions as: how many people have climbed all the Furths? How many have climbed all the Furths and all the Corbetts? What is the typical gap in years between compleating the Munros and the Furths? Has anyone bagged all the SMC lists? Of course there is the usual caveat that not everyone who compleats these lists necessarily logs the information with the SMC… And I also had to remove two Munroists before starting the analysis: #284 (the Unknown Munroist) and #666 with its blank data! 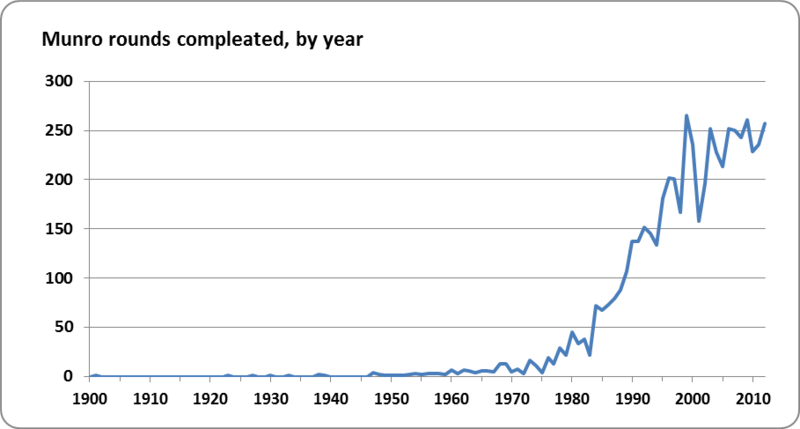 Munros compleations grew rapidly during and after the 1980s and appear to have settled at around 250 per year – with 2001 and 2010 as notable dips, perhaps due to the impact of 9/11 and certainly due to the impact of the eruption of Eyjafjallajökull. 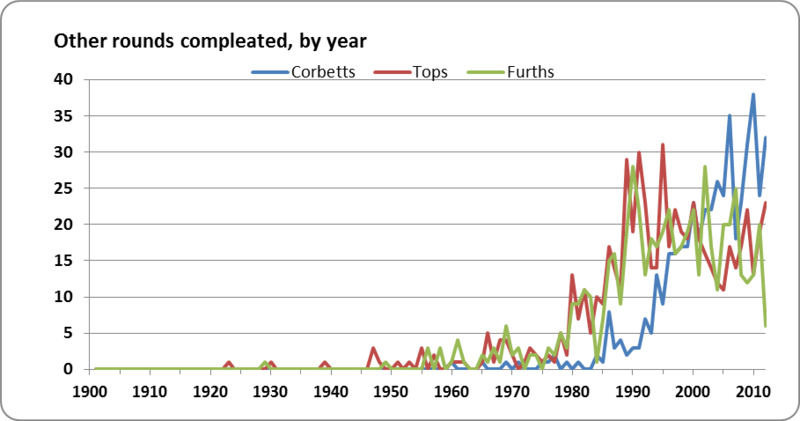 The picture for Tops, Furths and Corbetts is broadly similar, albeit with Corbett popularity being a decade or so more recent, and growing at the slight expense of Tops and Furths. Very few people have compleated more than four rounds of the Munros, although Steven Fallon still holds the record with an immense 15 (and growing). 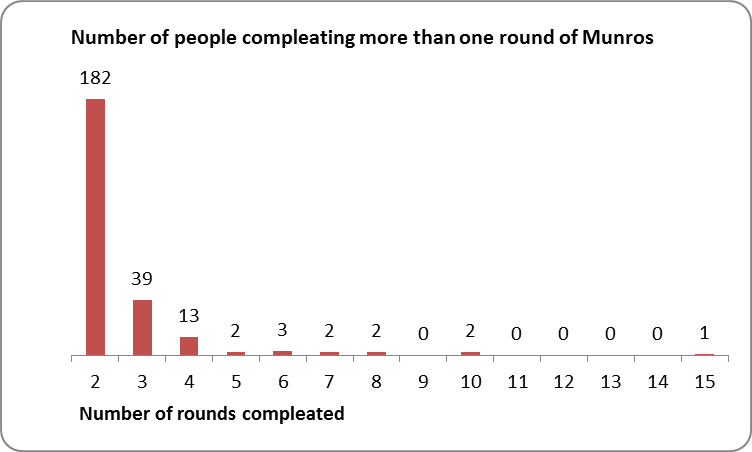 5,133 people have been satisfied with just the one round! Has anyone bagged all the SMC-maintained lists? Yes – a surprisingly large number: 27; and two of them bagged the lot twice! 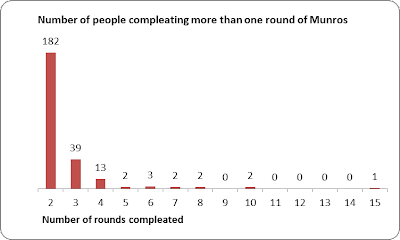 What is the time elapsed between individuals’ compleations of the various lists? The table below shows the data. Perhaps not surprisingly, just over half of those compleating the Tops (350) appear to do so in the same year as compleating the Munros. The figure is significantly lower for Furthists (138). Cobetteers tend to compleat many years after their Munro round. Looks like I’d better start on the Corbetts while the knees still have their cartilage.